The music by Jansky captured here on this free downloadable release released by Sirona-Records is a delightful collection and suitable to play to bring a friendly but modern atmosphere. 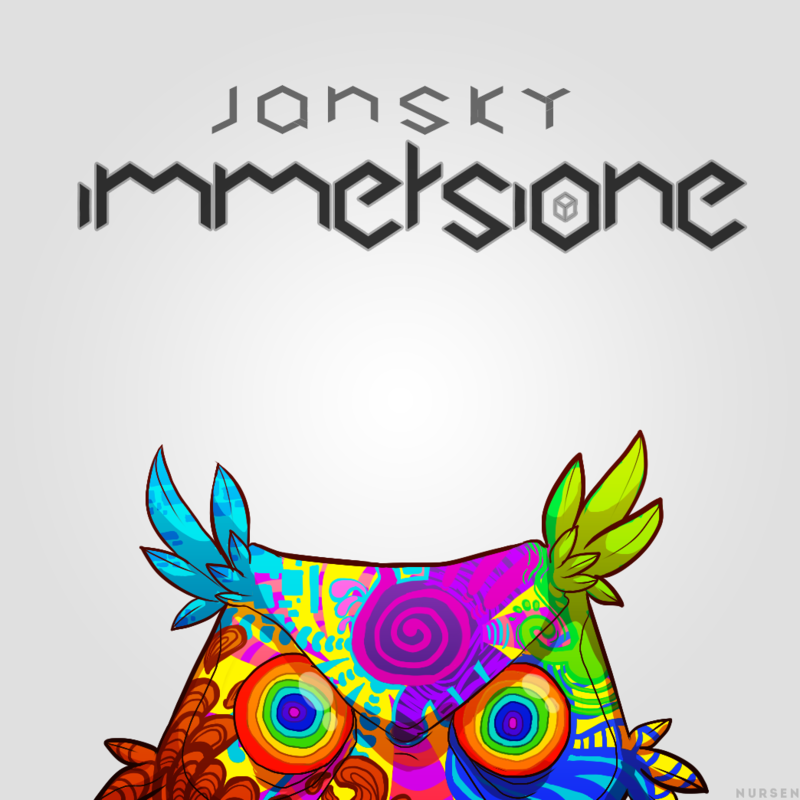 I’ve been playing a few of the Jansky tracks at a recent mix and mash matchup of tracks and deejay wise I can say they are fully interpretable with music genres from breakcore to IDM and even acid techno. Mixing some of these Jansky tunes in there and it’s like adding a certain taste of love on top to unleash a more gentle and experimental atmosphere that would suit a young audience that identifies with the words ‘cute’ and ‘cool’. One of the tracks that used is the openings track. It’s called ‘SpegnereINeuroni’ and brings a relaxed almost low laying rhythm, a voice that attempts to calm us down with instructions to ‘lie down on your back and concentrate so we don’t forget to breathe out and in..’ Count up that there is a calm relaxed xylophone kind of melody and you’ll be all set as a introduction that marries the feeling of good relaxed times with a fun sounding intro that makes you want to know much more about Jansky. Luckily Jansky gives us much more than you could hope for. This free album contains at least 9 quality tracks to please your ears (and mind). After being instructed to join the rest of the album in a calm state of being the track ‘Immersione’ emerges. It has a very friendly vibe with intelligent sounding production skills bringing a nice blend that corners itself in the IDM side of life with enough freedom to go beyond that box. The music hints to warm friendly jazz, lovely sounds and cute choice of instruments while an intelligent drum will give the track enough space to be enjoyed by all. This album might be called one that fits a social event. It seems that Jansky is aware of this and the positive effects that the music has on the general atmosphere when being spun at a gathering of people that are together for something exciting and need some music to keep that happy and positive feeling up and going without giving the feeling of going to a hyperactive rave or a boring band with sleep inducing capabilities. Jansky sounds fresh and exciting, friendly and strangely catering all kinds of generations of music lovers with its mix of modern and yet melodically friendly skilled music flows. But Jansky is obviously a producer not afraid of experimentation with so well music as well as music genres, blending things together that yet not have been blended so well together as of now. The work named ‘Nirvanai4MetriQuadri’ is such a delighted experiment that successfully manages to blend a rock vibe with electronica, experimental warmth and radio poppy strangeness that reaches the same allure as listening to a ‘Mouse on Mars’ record with Curt Corbain as a guest appearance while jazzy beats are chopped up and presented to give it all a positive swing. Jansky’s music might be very experimental at times but for some reason (even if it gets really weird) it stays in a certain attitude that doesn’t disturb but obviously keeps the listener (or listeners; if you play this at the social event) surprised and interested in what the hell it is that it is, but in a totally likeable and listenable way. A good example of this is a track named ‘FlussoDiCoscienza’. It’s one of the more experimental pieces that at the same time has a feeling of ambient and chill out that could be making some listeners question their ears, but in the end they nod in agreement in how good the music (and their music tastes) is. Jansky’s kebabbaro is one track that funny enough blends again a total strangeness together and make it seem logical and enjoyable. It is a bit more dark, perhaps it has to do with the chopped up choir sound and the more aggressive sounding drum programming that somehow makes a delightful appearance. But like a great director who knows when pushing the borders are too close to pushing someone off; Jansky keeps it all friendly and doesn’t steer away of bringing good vibes that could be enjoyed by all adventurous music lovers. The happy vibes of Balkan music even gets a Jansky treatment which turns out one of the positive and energetic highlights on the album. The interesting beat programming skills meet up with electric accents and lovely energetic played violin. It becomes more funky and fun and towards the end you forget your surroundings as it feels like being successfully transported to a gypsy party in the far future! The track ‘LinguaggioDelCorpo’ is basically good party vibes for everyone! Janksy throws in a strange mix of modern experimental chopped electro jazz with no artificial sweetness in a work named MantraDiProvincia. Half way the track goes more funky with nice crunchy beats and strange but fresh sounding use of synthesizer, samples and even a organ makes an appearance. Weird stuff but of the delicious kind! The last track is ‘AccendereINeuroni’ which is one last take on the sweet smoothness in which Jansky has blown away its new listeners with skill and also just simply lots of quality and original fun. A highly recommended album, listenable for anyone in need for modern electronica that is a bit weird at times but yet a total joy and inspiration. No fillers! 300% sure you’ll love this! This entry was posted in ambient, audio collage, avantgarde, chill out, dance, electronic, experimental, folk, glitch, IDM, jazz, synthpop, toytronica, trip-hop and tagged abstract, electronica, experimental, glitch, IDM, Other. Bookmark the permalink.